Traditional geothermal water to water heat pumps and air source air to water heat pumps are excellent options for low-temperature hydronic heating such as radiant in-floor heating. But what if you have a hydronic heating system that requires high-temperature hot water, such as hot water baseboards, radiators, or large quantities of domestic hot water? If this is your situation, you may need a high-temperature heat pump to heat your home or provide domestic hot water heating. Fortunately, there are heat pumps that can provide high-temperature hot water with very good efficiently. We manufacture two different types of high-temperature heat pumps, the WH Series heat pump, and the WC Series heat pump. 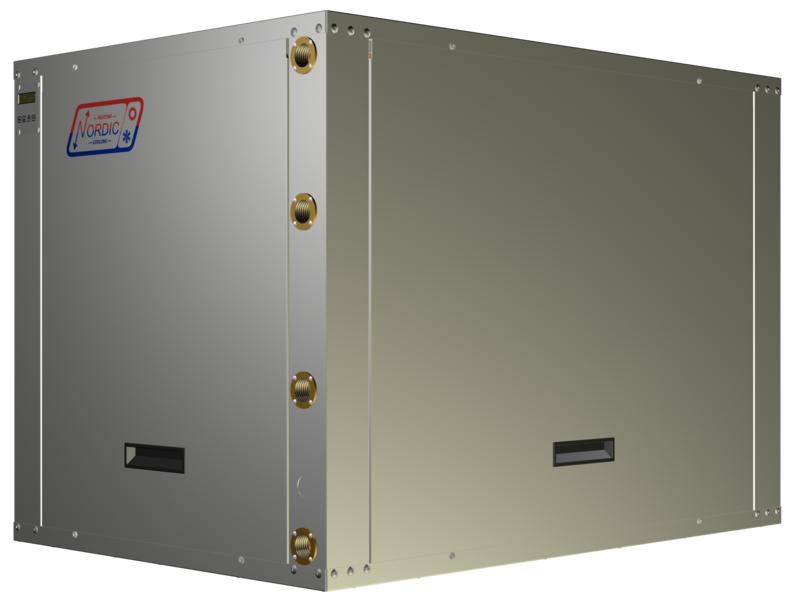 Our WH Series heat pump is a water to water heat pump, but instead of using a typical water well or geothermal ground loop, its heat source is a clean incoming liquid that has been pre-heated to between 50°F (10°C) and 122°F (50°C). Usually, this heat source comes from a buffer tank on the indoor side of a geothermal heat pump or a cooling loop from an industrial process. Using this pre-heated incoming liquid, our WH Series heat pump will heat hot water up to 160°F (71°C), which is warm enough for baseboard heaters, radiators, or dedicated domestic hot water heating. Our WC Series heat pump is also a water to water heat pump but it can heat hot water up to 160°F (70°C) from a regular ground loop or open water well. This makes the WC Series a perfect replacement for a home with a boiler or other high-temperature heating system paired with existing hot water baseboards or radiators. This heat pump accomplishes this big temperature lift by using a dual refrigerant system and is also available with a double wall heat exchanger for dedicated domestic hot water heating.